Teton operates 250 late-model tractors and 550 late-model 53' air ride vented trailers. The preponderance of our business runs to, from, and through our terminals in Knoxville, TN, Indianapolis, IN, and Lebanon, MO. Our network can best be described as a box starting in Dallas, TX, running to Minneapolis, MN, to York, PA, down to Savannah, GA, and back to Dallas. Ninety-five percent of our freight will stay within the confines of these boundaries, with the exception being all areas within the box to Southern California and back. Note that our terminal locations form a triangle inside the box, which allows us to secure or relay freight from any point to another within the box with minimal out-of-route miles. Below you will find our customer service area contact map, planning map, printable contact list, and equipment list. We look forward to serving you. 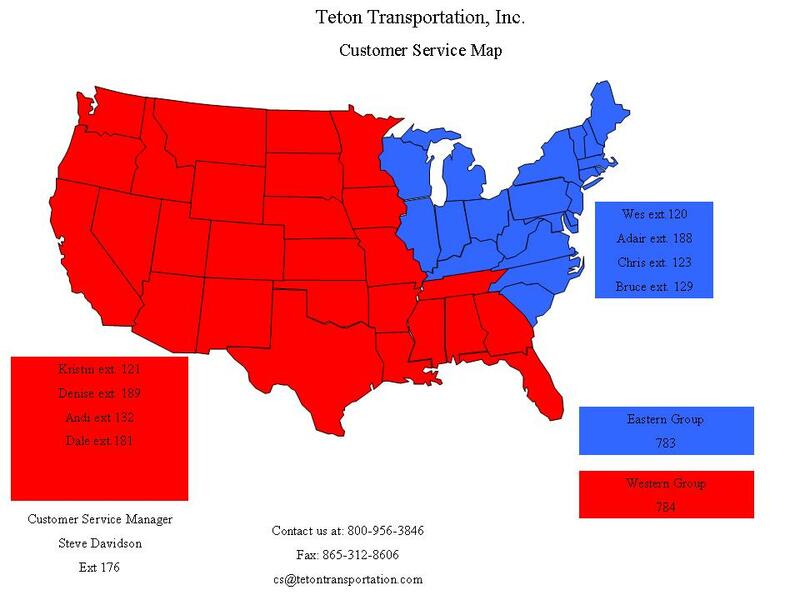 Teton Transportation purchases only quality late-model power units, the majority of which are Freightliner Columbia models. All units are equipped with satellite tracking and messaging. Our current truck count is 250 and growing!